The original from which this PDF file was produced was published in 1881. It contains an index for the Court of Probate at Chester from 1621 to 1659; and indexes for the Lancashire and Cheshire wills and administrations proved at Canterbury from 1650 to 1660. Some of the wills were for people from as far as London, Ireland, and Scotland. The PDF cannot be searched. 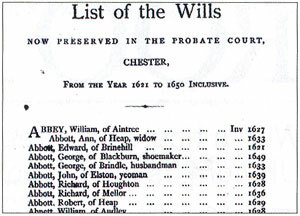 CHESHIRE RESOURCE : Part of the probate list at Chester. Acts of Parliament culminating in 1653 ruled that probates and letters of administration would only be legal if carried out by the Keeper of Prerogative Court at Canterbury. Thus we have Lancashire and Cheshire Data on this CD from records at both Chester and Canterbury. Wills can be extremely useful sources of information on family members, places of residence and burial, as well as prividing lists of an ancestor's possessions. The wills on this CD, in general, are those of substantial members of society - knights, gentlemen, esquires, with the occasional clerk, merchant, or yeoman. Listings are in alphabetical order and give the year of probate. Bear in mind that in any cases of intestacy, only inventories are identified rather than a detailed contents list.